Julie Marr and Francesco Creanza met in Puglia in 2014. Since then they have shared their passions for cooking and history by hosting workshops in Southern Italy, France and Vancouver. Their newly formed venture called Everyone at the Table embodies their philosophy of sharing time, food, and stories around a table where everyone is welcome. Janaki Larsen loves dirt. Everything about it, the colours, the smell, the feel. 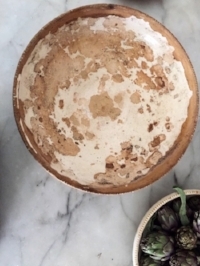 Her ceramics are often revered for their wabi-sabi nature and matte hues of blacks, greys, whites which create a harmonious connection between soil and form. When not in the studio, her other great love is setting the table. Here is an overview of how we will spend our 12 days together in Puglia. As we like to keep the structure of the workshop as organic as possible this schedule may change depending on weather or unexpected opportunities that arise. No previous experience with ceramics, textile dying or cooking is required. All you need is an open mind and an open heart! Day 1 July 24 - Arrive at Masseria Celano, settle in and meet for aperitivo and introductions followed by a long table dinner. Day 2 July 25 - A day all about clay. We will visit the town of Grottaglie, known for its artisan ceramics and learn about the history of pottery in the region as well as Janaki’s personal approach. We will then roll up our sleeves and work with the local clay to form some plates and bowls. Day 3 July 26 - A day of exploration of our own Masseria Celano, it's gardens, groves and vines. With our foraged herbs, fruits and flowers, we will travel to nearby Oria to cook a communal lunch which we will enjoy al fresco. In the afternoon take a historical walk of the town centre or work on your pottery hand building skills or other personal creative projects. Dinner out at our favourite osteria in Oria. Day 4 July 27 - A walk in the wild. A morning spent gathering inspiration and materials for an afternoon of dying fabric. This day is lead by painter Patricia Larsen. Evening dinner on the terrazza of the Masseria. Day 5 July 28 - After a free morning we will meet for a picnic lunch under the olive trees which will include an olive oil tasting and feature dishes from the Salento region. In the afternoon we will continue our exploration of hand building with clay and take a trip to Grottaglie to fire our cured pieces that we made on day 2. Dinner out on the streets of Grottaglie. Day 6 - July 29 - Italian Sunday! Day trip to the city of Lecce to explore the antique markets, have lunch in an off-the-beaten-track trattoria and do an informal wine tasting of Primitivo and Negroamaro wines. In the afternoon we will take part in the beloved Sunday tradition of the passeggiata through the historical centre to enjoy the beautiful Baroque architecture. Simple Sunday supper at home at the Masseria. Day 7 - July 30 - Glazing day in Grottaglie. We will spend the afternoon glazing and decorating the pots we have made. Late afternoon and dinner spent in the picturesque town of Martina Franca. Day 8 - July 31 - Beach Bonfire! After a morning of cooking, art restoration or making we will be off to the Ionian Sea to have a bonfire dinner and then use the embers to smoke fire some of our pottery. Option of sleeping at the beach, under the stars. Day 9 - August 1st - Breakfast picnic at the beach to retrieve our pottery from last night’s bonfire. Today is a free day to make, read, nap or do whatever you choose. Pizza dinner in Grottaglie with gelato for dessert. Day 10 - August 2nd - Let’s make some cheese! This morning is dedicated to the art of cheese making. We will learn the process for ricotta, bocconcini and other soft cheeses.We will enjoy the fruits of our labour at our lunch in the masseria dining room. The afternoon is open to make something of your choice using clay, fabrics or foraged materials from the masseria grounds. In the late afternoon we will visit nearby Ostuni, known as the "White Town", for dinner at an osteria that serves typical Puglian cuisine. Day 11 - August 3rd - Making day! A leisurely morning of making, creating and foraging in anticipation of our evening gratitude dinner. For lunch we will venture to a local bar to experience a true Italian custom known as “aperitivo". Farewell Dinner at Masseria Celano. Day 12 - August 4th - Breakfast and arrivederci! You will be staying at the beautiful Masseria Celano, a working organic farm located near the town of Grottaglie. Price Includes: roundtrip airport/train station transfers from Brindisi to Masseria Celano in Grottaglie. All meals, wine, refreshments, snacks and art making supplies. Copyright © *2018 Atelier St.George*, All rights reserved.